Although sadly, in some cases, churches have been inundated by rising water, but here the ability of the local people to clear up, overcome and be sources of spiritual and practical strength is inspiring. Old Main Street in Bingley, West Yorkshire, was flooded when the river Aire breached its banks. 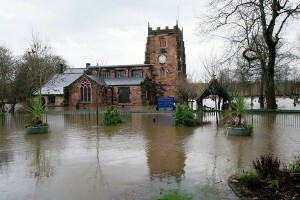 The parish church is located on higher ground opposite the flooded terraced houses. The vicar, churchwarden and members of the church rallied to the aid of residents providing tables to help raise furniture and belongings out of water’s harm, wading through water, waist high, in order to salvage belongings and feeding flood victims. The church remained open offering coffee and tea making facilities. Flood victims brought possessions – furniture, fabric, pictures and photos into the church for their safety and to try and dry them out. When the waters receded, church members helped local residents clean up and the church is fundraising for those who have no insurance or financial security. The manager of the local pub has been awarded a small grant from the Church. St Mary’s in Tadcaster was flooded when the River Wharfe burst its banks, sending three feet of water into the church. Pews and kneelers were left floating, and the organ was badly damaged. However, three feet of flood water can’t stop the congregation of St Mary’s – a short candlelight service of prayer was held in the church on Sunday 3rd January for all affected by the floods. The town’s 18th century bridge had also collapsed in the flood, so the church organised shuttle buses to pick up people from the east side of town. Those attending were advised to wear older clothes and shoes and bring a plastic bag to sit on. York Minster waived entry fees for three days offering, ‘some peace amongst the flood chaos’. Bury Parish church offered free Christmas meals to 50 local people affected by the floods. There are many examples of the wider church areas supporting those in need including Salford Deanery Synod which has agreed to underwrite a loan of £3, 000 from the Salford Credit Union. The loans will go to people who had no insurance and were flooded. The Halifax MP, Holly Lynch, set up her parliamentary office in Christ Church, Sowerby Bridge as it became a hub for shelter, and a point of contact. Further up the valley, the Revd Jeanette Roberts opened up St Peter’s, Sowerby and most parishes across the deanery and in the wider Huddersfield area teamed up with offers of help, donations and support. In the Calder Valley several parishes have been affected by the rising flood waters – including Mytholmroyd, Hebden Bridge and Sowerby Bridge. St Michael’s, Mytholmroyd and its Parish Hall were flooded to a depth of several feet and services are being held now in the local cricket club. In Cumbria, St Aidan’s church in Carlisle was flooded out, with the force of water knocking over pews. Isel Church has also been badly affected and at the height of the storm was surrounded by five feet of water. Patterdale church and meeting rooms have been flooded with a foot of water also in Kirkoswald Church. Flood water more than two feet deep swept into Appleby Parish Church, breaching a recently completed flood defence paid for by the local community at a cost of £50,000. Elsewhere in Cumbria flood water affected boiler rooms and basements at Natland Church, Staveley Church and Holme Eden Church. Those Cumbrian churches unaffected but in flooded areas offered fantastic resources for support and acted as reception centres. Christ Church in Cockermouth became a focal point for a one-stop shop centre where those affected could garner information from organisations including the local authority and the Citizens Advice Bureau. St George’s Kendal also opened up daily providing hot food and refreshment for those affected. Holy Trinity Carlisle also acted as a reception centre. Church teams worked across the county to help those affected both in the immediate aftermath and in the current recovery phase. In Cumbria, many schools were affected including Crosby-on-Eden CE Primary on the outskirts of Carlisle and the city’s Trinity School were both closed until after Christmas due to flooding. Trinity has now partially reopened and Crosby is due to reopen in mid-January with temporary classrooms. Advice and example disaster management plans are available via the Cathedrals and Church Buildings Division website.